The Red Sea at night. It is pitch black. The biggest challenge diving at night is to turn off your imagination and notice what is actually in view in your light; don’t imagine that there may be something else watching you from out there in the dark. If you can get your imagination under control, night is truly the best time to dive. The most colorful fish and other animals come out at night, and your light brings out the most brilliant colors without the dilution or distraction of sunlight adding reflections, distracting backgrounds, or particulate haze to the scene. 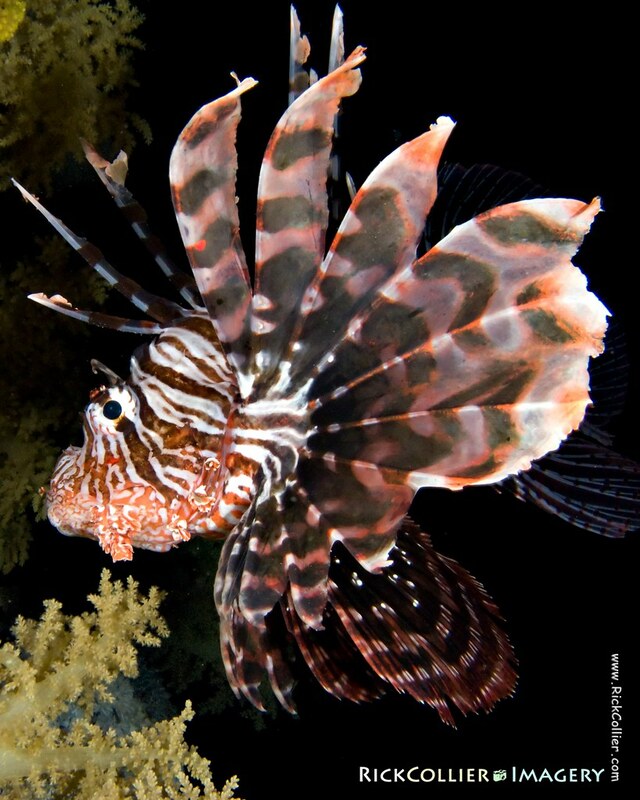 Though it seems exotic to many, the lionfish is not uncommon in the Red Sea. There are a couple of distinct varieties that one sees in the waters around Sharm el-Sheikh, and (not unexpectedly) the “common lionfish” is … well, common. In the daylight, these predators are usually tucked up in a hole or overhang in the reef. Like many reef predators, they come out and swim freely to hunt at night. When threatened, the lionfish turns its face towards the reef and spreads its barbed fins like a pincushion to anything bigger that may be considering taking a bite of lionfish. They do not move very quickly and are not aggressive but the spines in this fish’s feathery fins are loaded with poison, making for a very unpleasant experience if one happens to get too close. Trapped in a diver’s bright lights in the dark of night, how could the lionfish see anything but a threat? This guy (or girl) maneuvered to its best ability to present me with only tail and fins, but there was no actual hole in which to hide nearby — only a wall covered with soft corals. I was able to swim around it and catch this profile as the fish tried to turn toward the reef and away from my lights. This entry was posted on Saturday, August 1st, 2009 at 20:52 PM. It is filed under thePhotoTourist, Underwater and tagged with coral, dark, destination, Egypt, fish, lion fish, lionfish, night, Red Sea, reef, scuba, Sharm, Sharm al-Shaykh, Sharm el-Sheikh, spine, travel, turkey fish, Underwater. You can follow any responses to this entry through the RSS 2.0 feed.